Family First Aid Kit – Clean it, Fit it & Back to Play! top priority. After purchasing several of the major items to prepare for the arrival of my child, I’m starting to think about keeping her healthy, happy, and active. 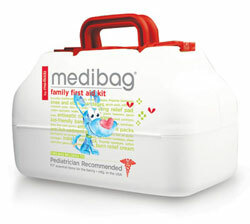 ME4KIDZ offers MEDIBAG, the original kid-friendly first aid kit and I’m happy to find a place for it in my home. I can’t guarantee that “owies” won’t happen. Actually, I’m quite certain they will, but I can be a little more prepared. The included flip chart is everything a certified CPR instructor would do; and the house-proofing CD gives wonderful tips to protect your child from harm. Hopefully, I’ll never actually need to use it, but just knowing that I have it on hand puts my mind a little more at ease. This entry was posted in Baby Products, Children, Newborn, Newborn Products, Nursery, Pregnancy, Pregnant, Uncategorized and tagged Babies, Baby, Baby Product Reviews, Baby Products, Children, Family, Maternity, Newborn, Newborn Products by lesleycarter. Bookmark the permalink. Children will enjoy the kid friendly side and parents will be happy to know that they are prepared. It’s a great find. The one thing not on the list: remain calm. I know that sounds obvious, but as a mom, that was the hardest, and yet most important, thing to do. I was not, as a young mom, calm about how much they were eating, how much sleep they’d had. But somehow, when they were hurt, it was like someone else possessed my body and brain and made me calm. I spoke calmly, I felt calm – until after whatever the crisis was had passed. I’m an “old” mom now – there are still “crisis moments” – they just don’t require me to have a first aid kit. A ready ear and an ability to give out advice without overstepping. Suggest a trip to the doctor without nagging. Enjoy every moment. People say that all the time; they say it because it’s true. 18 years from now, you will LONG for the days when owies could be fixed by something in a box. This does look cool, though, and good for you for getting cpr certified. They should make it a requirement before letting a child out of the hospital, just like they do with car seats now. I love being reminded of the pre-baby nesting. What a magical time! A great website that helps you know when to worry and when to stay calm is askdrsears.com. I can’t count the number of times this has helped us with the bumps, colds and fevers that kids seem to get. I love it too. It puts my mind a little more at ease. What a fantastic idea, it’s the first time I have seen one. They are fairly priced and an excellent resource. I don’t think you can go wrong with ME4KIDZ. Pay special attention to the CPR training responses to choking for babies. Practice regularly on dolls so the reflex is automatic! I had just re-upped my CPR training and had to perform it on my 18 mo. granddaughter. All ended well, and while her mom nursed her afterwards to calm her down, I went upstairs and cried. It was scary, but I was ready and able. I hope you never have to do it, but it’s important to know–and know it well! hmmm… you’ve made me think. We havent got a first aid kit. Must go buy one today. I’m glad it sparked interest in you. ME4KIDZ has a few other great options as well. Oowies will happen! Its unavoidable. Children are born with a radar that leads them to getting hurt! I don’t know why but it happens. I just plan on it and it seems you have too! Just pray they do no permanent damage and as a previous poster said, remain calm. Thanks for the post. That is such a nice kit. I could not find one I liked an the one I had for hikes and stuff I felt was not adequate for a baby/toddler. so I bumped it up abit. At least I know I also have stuff if necessary. While I was about it I also put one in my car…. You never know when you might need it. Lesley, thank you for sharing all these great ideas and items for those people becoming parents, whether for the first time or not. Your picks have been awesome; the things a parent might and (in some cases will, unfortunately) need or want. Sounds like you will be a well-prepared and ready mom! Cheers! Really cute kits. Remember to add a scissors and small safety pin so that when you put on a bandage you have everything near by. I’ll be sure to do that today. My babies are now 19 and 23 yo and you really begin to understand that once your journey as a mom begins, it never ends. It truly is the adventure of a lifetime and the most awesome experience ever. I have a new book out about new motherhood and how to balance personal and family needs. Let me know if you’d like a copy and I’ll enclose some bandaids as well. Best 2 u.
Wow! That would be wonderful! I love great resources, especially as a teacher; it just seems like part of my nature. Your babies will always be “children” in your eyes I’m sure. My mother is still my mommy when I need support. The only other thing I would add to this, though of course confirm with your doctor is some type of generic tylenol and, more importantly, child benadryl. One thing I learned the hard way is that children can have severe reactions to mosquito bites. My son’s arms and ankles have been known to almost triple in size from some and these were at our home. I would imagine it could be worse if he had been bit in other countries while traveling (not yet, thankfully!). Of course, bug protection is key but I have yet to find one that works that does not have DEET. Neem oil has been the best to date but even that is not great. I picked up the Tylenol and child Benadryl as soon as you suggested it! Thanks for a great recommendation. A great thing to do us attend a specific baby first aid course as some of the techniques are very different for infants compared to adults. My wife organised one for our whole mums and bubs group and all the dads came along too. It also was a great way for the group to bond. The dads were happy as they were incentivised to attend by a trip to the pub afterwards! All very prepared! However, you are not, really. But it is OK! That is normal! You can´t get prepared for everything. The most important thing is to keep calm and listen to your mother instinct as well as your baby. By having little kits like this, I feel more prepared and organized so when little things happen, I won’t panic as much. It gives me a sense of relief. 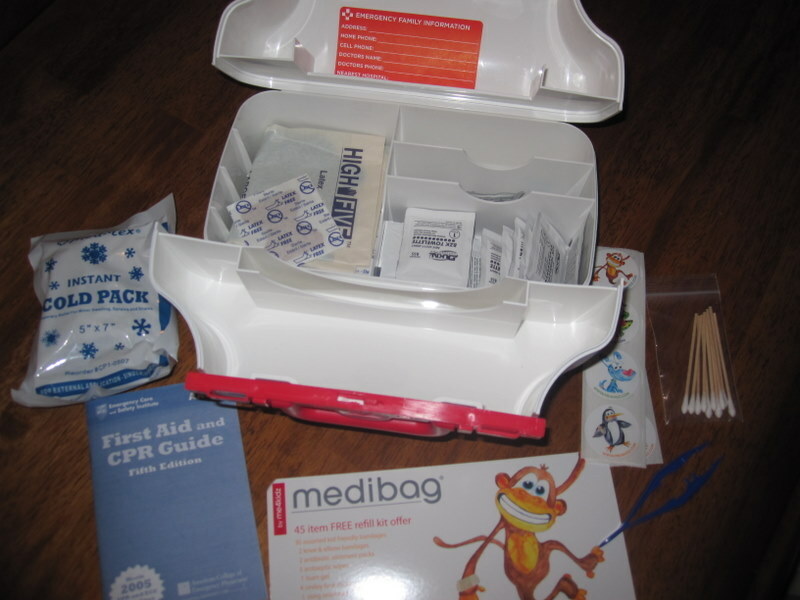 As I first read the post I got to thinking about the First Aid Kit we carry when we go into the back country. I have been a paramedic for several years and am well versed (much more than I ever desired to be) in battlefield medicine, so my extended back country kit while I am sure it breaks a couple of laws because of a few contents, I could perform moderate surgeries with it. LOL. Then I got to thinking just how inappropriate and downright lethal many of the medications and instruments in it are to children and adults as well, and now I am maybe re-thinking about what all goes in it. So just out of curiousity, when you guys leave civilization and for several days in the bush, do you carry an extended “Jump Pack”?